Several months ago a prominent restaurant architect returned from a trip to Japan bringing us a small gift of green tea. He said, "I have no idea if this is any good, but I loved the packaging. I just had to give it to you." And so we examined the slender pouch of tea, the size of a small puffy envelope, sporting a beautiful water color of a Japanese woman with a flower in her hair. This diminutive offering, whose contents weigh less than an ounce, elicited powerful emotions. It evoked an unexpected feeling of calm and grace and provided a narrative of a faraway, almost magical place. I immediately thought of a book I read when I was a kid: The Hidden Persuaders. Written in 1957 by social critic and advertising guru Vance Packard it demonstrated the power of color, type, and imagery in the choices we make every day -- why we buy one product over another and what "hidden" factors drive our needs. I'm not at all suggesting that my desire for this particular green tea was a result of manipulated expectations, but I was aware, as I was after reading Packard's book as a teenager, the subliminal urge to learn more about GARASHA -- the brand name of the "extra choicest" green tea produced by Japan GreenTea Co., Ltd.
My interest was further piqued because tea shops these days are on the rise in the United States. Starbucks last year purchased the 300-store Teavana chain and is expanding it rapidly. And Talbott Tea was purchased by Jamba Juice. So something's in the air. Established in 1969, the company is the leading tea trader of worldwide teas in Japan and the pioneer of Japan's herb and spice retail trade. In 1982, the company opened Japan's first herb and tea shop "Tea Boutique" in Tokyo, and they now manage four tea rooms in Japan. With 90 employees, the company, whose president is Isamu Kitajima, has dozens of trading partners all over the world and imports and distributes in Japan rarefied products like Cerulean Seas Sea Salt (from California), Argan oil from Morocco, and Cafix from Germany -- a caffeine-free coffee made from herbs. Interestingly, the name Garasha is the Japanese pronunciation of the Latin "Gratia." The name, which means grace, underlies the spirit of the company's ethos: a commitment to a healthy life by the grace, or gifts, (Garasha) of nature. The traditional teas, in these compelling restored old tea packages, come in three styles. Genmaicha green tea is combined with roasted brown rice; Sencha green tea is steamed to prevent oxidation and results in a sweet and fragrant brew, and Hojicha green tea is roasted. Like the special art of pairing wine with food, each of the teas matches well with particular dishes. Given the well-documented health benefits of green tea these days, I may do a tea-and-food pairing exercise soon. Will let you know how that goes. In the meantime, here is a lovely drink to try as warmer weather, and cherry blossoms, are soon to arrive. It comes from my book, Healthy 1-2-3, winner of the IACP Cookbook Award (and nominated for the James Beard Award). It is a recipe for iced green tea, stirred with stalks of lemongrass. 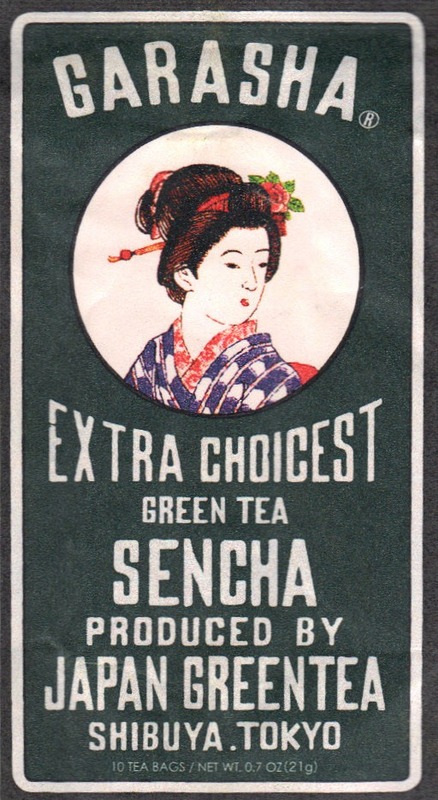 Use Garasha's Sencha green tea, if you are lucky enough to find it. ICED GREEN-LEMONGRASS TEA Green tea is known to be very healthful, full of antioxidants and other good things for your body. Lemongrass, a long pale green stalk, is a staple of Thai cooking and adds a mysterious, citrusy flavor. A squeeze of fresh lime is optional.